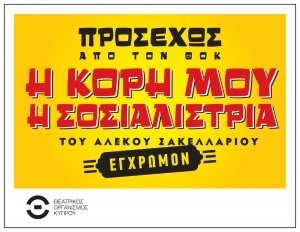 The Cyprus Theatre Organisation will this summer be bringing the much loved Greek Cinema classic by Alekos Sakellarios My Daughter the Socialist to the stage, directed by Achilleas Grammatikopoulos. The performances of Aliki Vougiouklaki, Dimitris Papamichael, Lambros Konstadaras, Hronis Exarhakos, and other talented actors, together with the music and songs of Giorgos Zampetas, have withstood the test of time. The characters we have came to love in the film will come to life on stage and with their quarrels, strikes, Sunday excursions, romance and plenty of song and dance, will light up our summer nights. Liza, the only daughter of industrialist Antonis Delvis, returns from her studies in London to Athens as she is due to succeed him in running the factory. Her ideas however are too progressive and clash with those of her conservative father. During a peace march, in which she participated despite Delvis' explicit ban, Liza rows with a peace activist who as it happens works at her father's factory, a detail neither is aware of. When Delvis decides to fire all the workers who took part in the march, the rest go on strike in protest. Liza sides with the workers, runs into the young activist and soon falls in love with him. The play is in Greek.